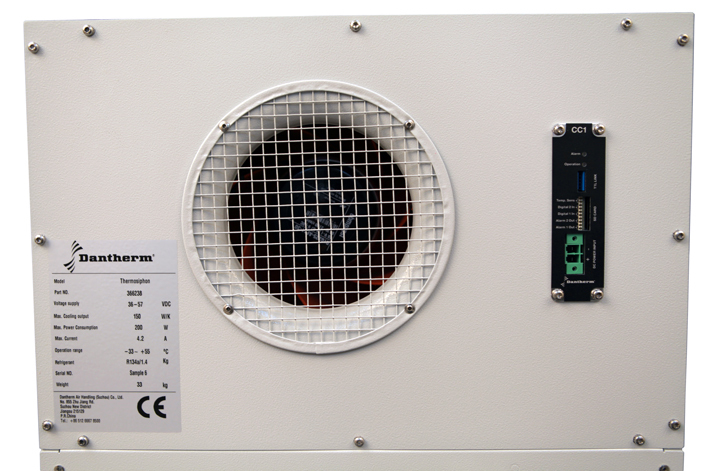 The Dantherm DC Thermosiphon provides cooling without air conditioning and is specifically designed with Telecom installations in mind. Thermosiphons are next-generation heat exchangers, because they have a more compact way of generating heat exchange than traditional air-to-air heat exchangers. In other words, Thermosiphons generate more cooling in smaller spaces. Passive cooling systems are among the most energy-efficient in the market, next to Free Cooling. The closed loop control system ensures a clean internal environment for sensitive electronic equipment, which means that no filter is needed. The Thermosiphon is easily installed without affecting uptime, which secures site earnings even during installation and service. Dantherm is among the first suppliers to enter the market with a fully industrialized version of this concept and already has experience from 50.000+ Thermosiphons running in the field. Main cooling mode with dynamic, step-less fan speed control. Power save, boost, emergency cooling, self-test. IP-connection, LED-signals, TTL-link, SD card. Leakage, voltage and function test from factory. No need for cooling technician. No soldering or refrigerant filling on site. Mono-block, plug and play installation.